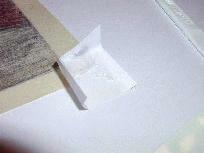 Very often, shin hanga prints we get from dealers or auctions are glued into paper folders or mounted on a backing. 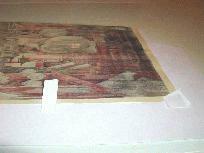 Most collectors prefer to remove the print from its support, for reasons of aesthetics, inspection, storage, and especially for conservation. 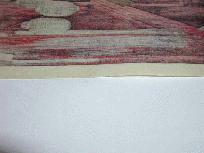 One should usually assume that the print has been glued with or mounted to materials which are non-archival (acidic). 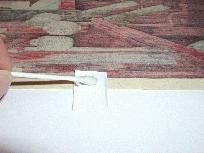 Brave collectors perform this removal "surgery" with a knife or a letter opener, at the risk of the print being damaged. 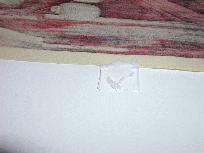 The following step-by-step process illustrates how I safely remove a print from its support, by careful, controlled "shaving" the paper off with a round-shaped scalpel. 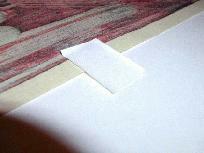 First, all attached paper should be cut back with scissors as far as possible. 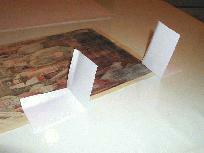 Fold the paper upwards and cut from inside the print towards the outside, thus minimizing the risk of accidentally cutting the print. 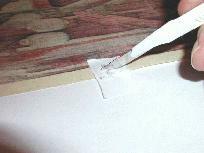 Scratch the paper off with a scalpel, repeat the wetting if necessary. 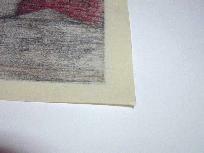 Move the scalpel from inside the print towards the outside, holding the print on the remaining small paper tongue. 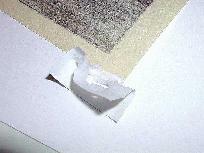 Remove remaining glue with a wet cotton swap. 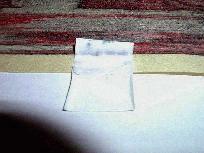 Dry the wet surface with a blotter. Old paper hinges can be removed the same way. 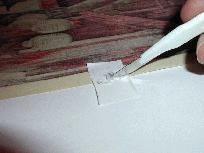 This method works well with water-soluble glues like rice paste, etc. The patient: Print, glued into folder. 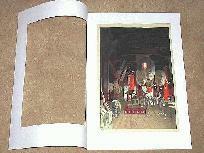 Photographs and original text as written and submitted by Andreas Grund for this article are his property, copyright © March 2000, all rights reserved. Your feedback is welcomed -- please send in your comments and suggestions. Editor's note: Another contributor reports using substantially similar methods, but using a different surgical instrument. 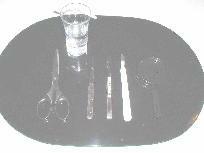 Yet another collector writes: Having tried a number of different methods, I've had better and more consistent results by carefully steaming the backing paper over a tea kettle, starting from a corner, and very slowly and carefully peeling the two apart. Last one I did took over two hours, but with excellent results.